In the latest release (build 96), some cool new features have been implemented to give users improved functionality and increased transparency. Users can now view or update a particular event or data field for multiple work orders belonging to the same shipment with same or different values in one go. This cuts down update time drastically when the same event or data field has different values for each work order. Users don't need to go into each work order to update the field. Here, you can see the selected event for all work orders in the shipment. 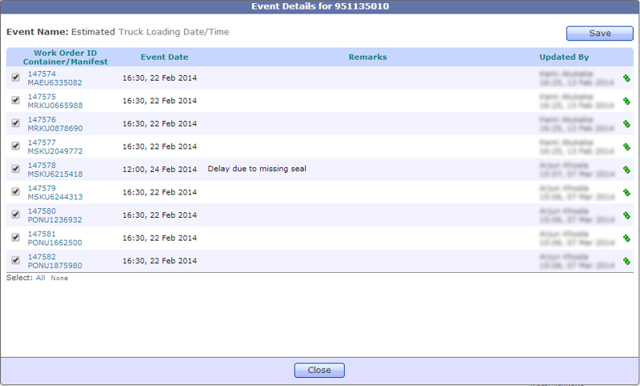 You can update the event corresponding to any container as required, just like a regular event update in TrakIT and click on the 'Save' button. To copy the event date/remarks to other rows, select only those containers that you wish to copy to (by selecting/deselecting the check-boxes) and click on the icon (Copy to Selected) on the row from which you wish to copy. For example, if there are 30 work orders in the shipment and you wish to update the event for only 15 of them, just select those 15 rows, enter the event in any one row and click the icon for that row to copy the data to the other 14 rows. 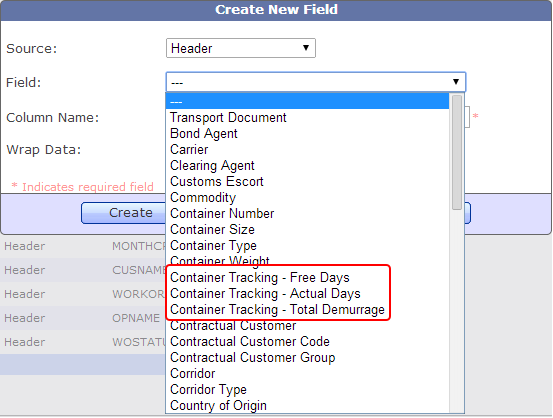 Event fields cannot be updated out of sequence (unless allowed in the corridor), and this may differ for different containers belonging to the same shipment. The same validation process applies as when updating events normally. The data is, of course, obtained from the Container Tracking module. The work order in question must be active in the Container Tracking list, otherwise no figures will be populated. While creating/modifying an event field, the 'Select Option' menu gives you the option to choose 'Event Completed Count', which when selected will display the count of work orders for which this event has been completed. Using this in conjunction with the 'Total WO' field, you can check whether a particular event has been completed for all work orders in the shipment. For further queries on the above features, please contact TrakIT Support.